Eleven of 12 Defendants Found Guilty Today in the Atlanta Schools Cheating Scandal | Georgia Teachers Speak Out! ← McDuffie County Superintendent, Mychele Rhodes, Apparently Is Trying to Terminate The County’s STAR Teacher Over Rubrics And Other Such Silliness! I Never Cease To Be Amazed At Today’s Goofball Superintendents! LOL! 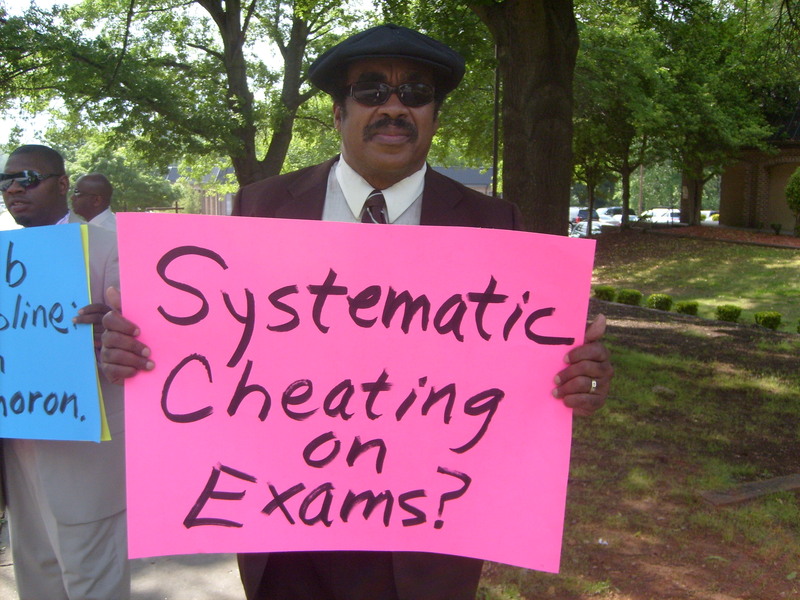 MACE shouted from the rooftops about “systematic cheating” going on in the Atlanta and DeKalb school systems…way before the media got involved. 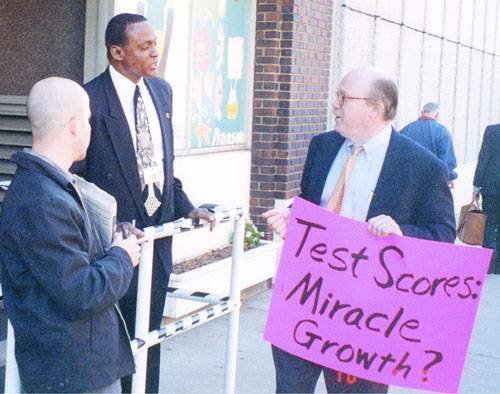 We had this phrase on picket signs and talked about the “miracle growth” in test scores. We did this for 15 years. We have the photos to prove it…and even included several photos of such in The MACE Manifesto. God rest her soul but it went straight back to the office of the late Beverly Hall. It was systematic, widespread, and directed. You can see that MACE was the lone wolf in the wilderness concerning the testing irregularities as well as the “gangsta” nature of the Atlanta and DeKalb school systems. Yes, MACE called both school systems “gangsta school systems” in writings, on videos, and on picket signs. But, there are “gangsta school systems” in the rural parts of Georgia too. MACE does not like what it is hearing coming out of several of these smaller school systems where nepotism seems to be a given and competitive bidding seems to be unheard of. I received a phone call last night from a former member of the school board in one of these more rural counties. People are mad. People (and especially the beleaguered teachers) will only take it so long…and then they will rise up! Real school reform takes place at the ballot boxes. These uninformed and rubber-stamping school board members who let these appointed superintendents run roughshod over the professional educators ought to be thrown out on their ears at the next election. What I would like to see is some of these retired teachers (and teachers who teach in one county but live in another county) run for school board seats. I’ve been known to help many a teacher to get elected. This, I think, is why the Atlanta Journal-Constitution essentially called me everything but a “white man” in the old days…before they cleaned up their data base and removed any pejorative term used against me (and even took away some rather flattering ones!). DeKalb County in 2009. 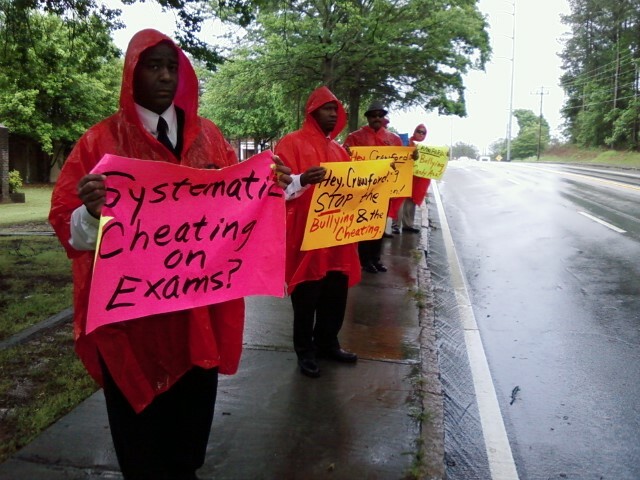 A few weeks after these three-day pickets in inclement weather, the cheating scandal at Atherton Elementary broke on the news and the principal and assistant principal lost their jobs at Atherton. Also, around the same time there were allegations from a teacher at King High School about systematic cheating. Shortly thereafter, then Superintendent Crawford Lewis was indicted on other matters. This picket in the hot, hot sun was in front of Douglass High School in Atlanta. Several other times MACE warned the public about systematic cheating in the Atlanta Public Schools — way before the national media scandal broke wide open. At the time, the “city fathers” apparently wanted to turn a blind eye to what the Beverly Hall Administration was doing. Some of the administrators who were convicted today were targeted and fought against by MACE leaders. 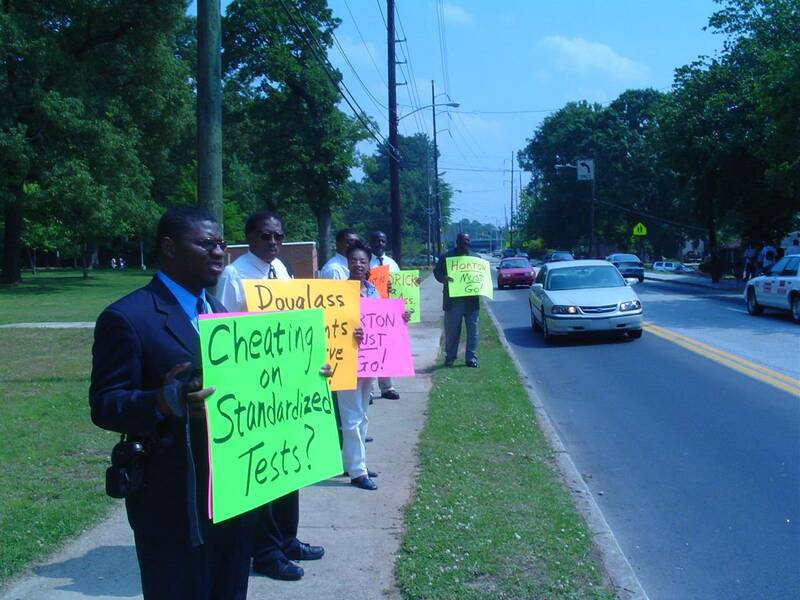 MACE was picketing against systematic cheating in the public schools of Atlanta was before it was cool to do so…even when the headquarters was on 210 Pryor Street (about 15 years ago). At the old Central Office headquarters on 210 Pryor Street about 15+ years ago. How can this situation be resolved and get the man back into the classroom? The students are the ones suffering the loss!! Ruth, you and your friends need to call and contact personally the elected school board members and let them know how you feel! They respond to public pressure. By the way, I think that you might have meant to ask this question under the second article on the page. You may have accidentally asked it on the section below the Atlanta cheating scandal…which is OK. But, if you want to ask the question in the section under the McDuffie County article, then I will respond there as well. Yes, you are right. I should be about the children! Thanks for commenting!